SAW010246 SCOTLAND (1947). Edinburgh, general view, showing The Meadows and George Heriot's School. An oblique aerial photograph taken facing north-west. 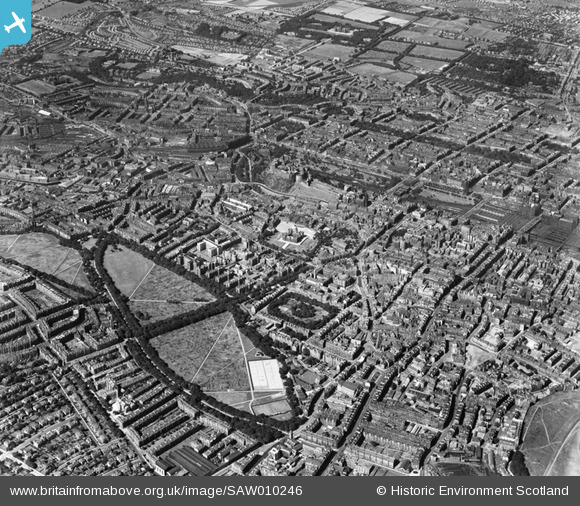 Title [SAW010246] Edinburgh, general view, showing The Meadows and George Heriot's School. An oblique aerial photograph taken facing north-west. Former St Bernard's football ground, soon to be King George V Park. City Park, developed as home of Edinburgh City AFC 1935-55 when their lease was not renewed. Later used by many Edinburgh clubs, including a reformed City, but developed for housing after c 2013. Inverleith ground, Scottish rugby internationals were held here 1899-1925. Before RCAHMS redeveloped the building, this was C&J Brown’s furniture depository. The Meadows - they look much different now , an open grassy space. At the time "Charteris Memorial Church", now called "Kirk o' the Field"
Are these Allotments, showing that people continued to 'Dig for Victory'after the Second World War? 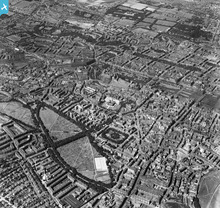 The Meadows area of Edinburgh is another example of a 'green island' of public leisure space, set in the middle of densely developed areas which surround it. This was originally the South loch area of the city (the companion to the 'North Loch' at the edge of what is now Princes Street). Both were drained and turned into public garden space in the 18th century.